I was in a Wichita restaurant when the Wireless Emergency Alert (WEA) test went off earlier this afternoon. All phones were supposed to have alerted at 1:18pm CDT. They didn't; not even close. While my iPhone 5 did trigger at 1:18, most phones in the restaurant didn't trigger until 1:21 and two did not trigger until 1:23 -- a five minute lag. In the case of a tornado warning, that lag could get you killed. When I have been storm chasing there have been times WEA did not trigger at all even though I was in the geographic boundary of a tornado warning. Of course, this was a "Presidential Alert" which is supposed to be the highest, most urgent. If nuclear warheads were incoming -- when we would have a maximum of 20 minutes to prepare -- a five minute delay is inexcusable. 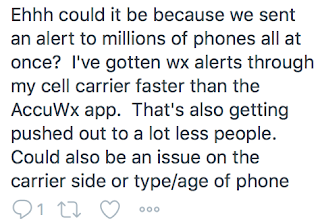 So, in spite of what some are saying, this test proves what I have said on numerous occasions (here, among many others): WEA does not work and, at least in Tornado Alley, you should have AccuWeather's App on your SmartPhone and WeatherCall on your home phone (two separate methods!) if you want to make your phone your primary warning tool. If not, AW on your smartphone or a NOAA Weather Radio, at least. immediately and every single time regardless of the number of phones involved. It doesn't. On average, the NWS gives 8 minutes advance notice a tornado is approaching. A five minute lag is far too much. This meteorologist believes I am wrong to cast doubt on the warning system. 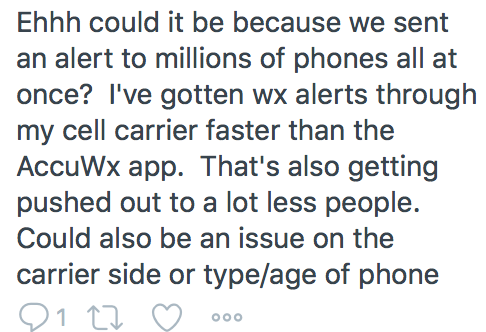 I'm saying this because I believe, strongly, the NWS warnings are valuable and should be conveyed immediately to everyone in the geographic area of the warning. The themselves warnings work. WEA doesn't. That is why I urge people to use something more reliable. I do not want someone to see one of these billboards and think, "I've got a new smartphone, I'm covered" when the system is as flawed as WEA. 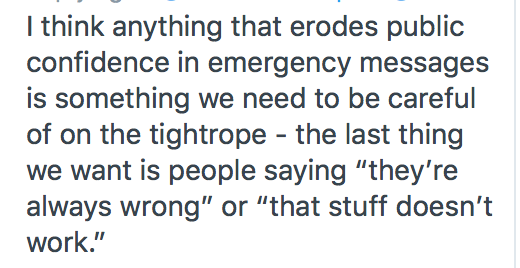 As you can see, I am going out on a limb with my peers because they don't like failures in the warning system discussed externally. 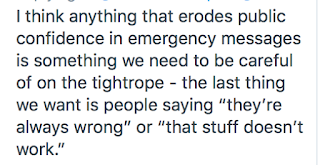 I believe people whose tax monies support the warning system have a right to know when it works well (I wrong an entire book on this subject) and when it fails (as today) so they can make the best decisions possible to protect themselves and their families. ADDITION that speaks for itself.